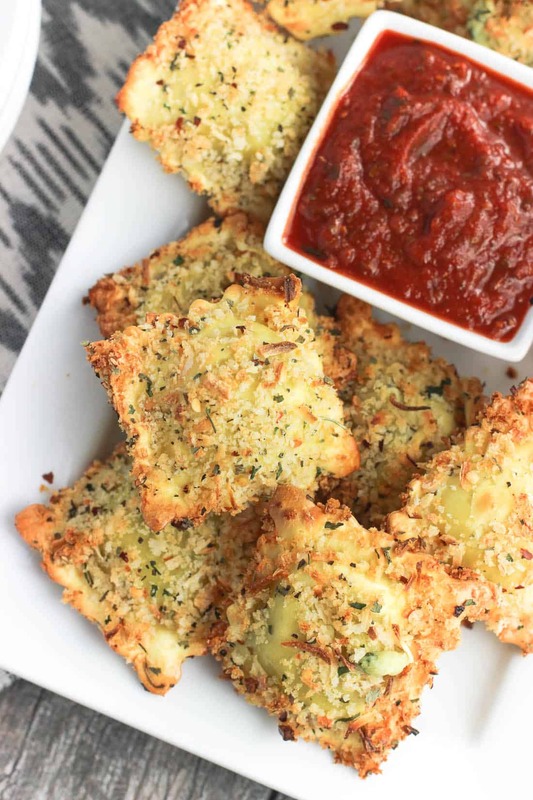 This easy recipe for crispy and baked toasted ravioli will be a new appetizer favorite! 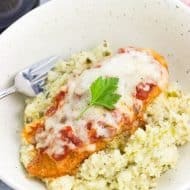 Ravioli is coated in egg and an Italian-spiced panko breadcrumb mixture and baked for a crisp dish that’s made healthier! Serve with marinara sauce. Somedays you just n-e-e-d something tried and true in your everyday eats. But not just anything. Comfort food is pretty much always a good idea, but with the temperatures creeping up and the sun staying out later each night, sometimes ooey gooey cheesy (read: rich!) doesn’t seem quite right. Salads, zoodles, and smoothies are well and good too, but sometimes I’m just not in the mood for something so light. I like a nice balance. So I present to you crispy and baked toasted ravioli. 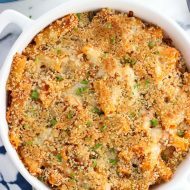 Refrigerated ravioli are dipped in egg and coated with a panko breadcrumb mixture, then baked to crisp up just right. 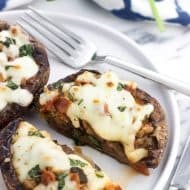 Served with a warm marinara dipping sauce, these make an awesome appetizer recipe (or light meal served along with a side salad)! It would make sense to use Italian seasoned breadcrumbs here in the coating…but that would be too easy, wouldn’t it? Turns out the extra ‘Italian breadcrumbs’ I thought I had on the tippy top shelf were my second back-up box of plain panko, but thankfully my spice cabinet came to the rescue. 🙂 I added dried chopped onion to the breadcrumbs (along with the usual spice culprits) for an extra bold flavor, and a shake or two of red pepper flakes for a little heat. And oh – use whatever flavor of ravioli you like! These were filled with spinach and ricotta, which we really liked. 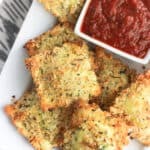 To help these crispy and baked toasted ravioli become, well, crispy as they bake in the oven, give them a spritz of olive oil (using a refillable olive oil sprayer) or cooking spray and cook them on an oven-safe wire rack over a baking sheet. Using a rack keeps the ravioli off the baking sheet and prevents the undersides from staying soft. Plus there’s no need to flip them halfway through – less work for a healthier-for-you win. 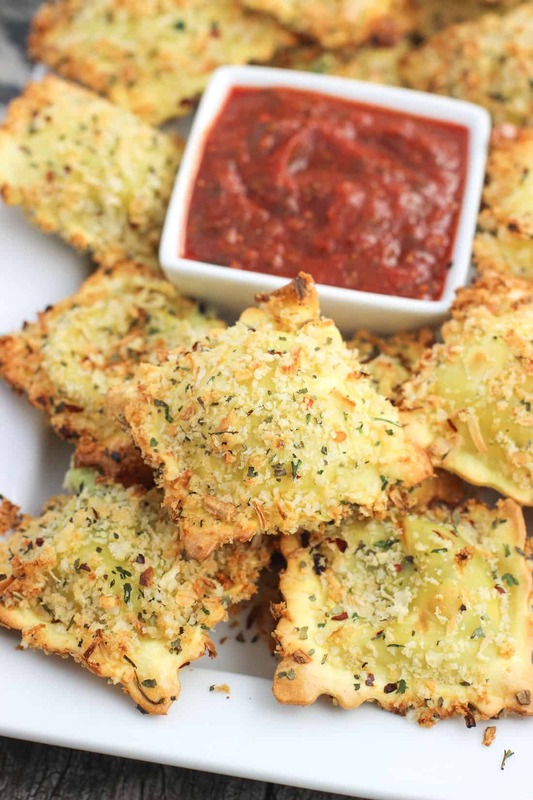 Watch this video to see how easy these baked toasted ravioli are to make! Heat oven to 400 degrees F and place an oven-safe wire rack on a baking sheet. Spray rack with cooking spray and set aside. In a bowl, add egg and water and whisk until egg yolk, egg white, and water are evenly combined and mixture is light. In a separate bowl, add breadcrumbs, onion, basil, parsley, garlic powder, and red pepper flakes and stir or whisk until combined. Dip each ravioli in the bowl with the egg mixture, and then coat ravioli with breadcrumb mixture, pressing breadcrumbs onto the ravioli to help them adhere. Place ravioli on the rack. Repeat for all ravioli. Once all on the tray, spray ravioli with olive oil or cooking spray. Bake for 15-20 minutes, or until ravioli are golden brown and crisp. Remove and let ravioli cool for a minute or two before serving with warm marinara sauce (or your desired sauce). Nutritional info is an estimate including 2 tbsp of marinara sauce for dipping per serving. Check out this baked ravioli with spinach and mozzarella for another easy way to prepare refrigerated ravioli! Do you think that the toasted ravioli could be cooked in an air fryer? Hi Cecelia, I don’t have much experience at all with an air fryer so I couldn’t say for sure, but I bet that it would possible! Just not sure on what kind of modifications would be needed to the recipe. Please let me know if you give it a try! Love that these toasted raviolis are baked! So good and crunchy! I love the healthy, low-fat choice of crispy ravioli. Delicious sauce too! Do you think you can make ahead and warm up in the microwave before serving? Hi Karen, I haven’t done it but I imagine the taste would be there, but they wouldn’t be as crisp as they would right out of the oven. Hope that helps, let me know if you give it a try! For those with wheat/gluten allergies, I bet puffed quinoa would work to replace bread crumbs too. Hi Evie, I’ve never made these ahead of time so I couldn’t say for sure how they’d turn out. I’d imagine they wouldn’t be as crisp. 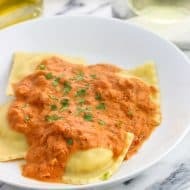 thanks for the wonderful way of making raviolis in a different way. did them and came out great. I’m so happy to hear that you enjoyed them, Ronnie! Thanks for sharing your recipe! I don’t have a wire rack, do you think I can lay the raviolis right on the cookie sheet? You are so welcome, Carolina! That would be fine. They may not be quite as crisp as using a rack but would still be delicious. I would either grease the sheet or use parchment paper to prevent sticking, and might flip them halfway through baking. I hope you enjoy! You can purchase a wire rack at the dollar store. If you don’t have a wire wrack, use a sheet of aluminum foil. Wrinkle it up so it’s not totally flat – enough so the hot air can move around the undersides of the ravioli. Do you have to boil them first ? The package I bought says to boil ? Hi Laurie, I didn’t boil them first. As long as they are the refrigerated kind (and not frozen) they’ll cook up in the oven as they bake. I hope you enjoy! I found them too rubbery. Next time I will boil them a slight bit. The taste was great, but the texture needed work. I took the leftovers and boiled them,. They were still good. Can you thaw out frozen ravioli and then follow your instructions? Hi Charles, I’ve only made this recipe using the fresh, refrigerated kind, but I don’t see that being a problem. 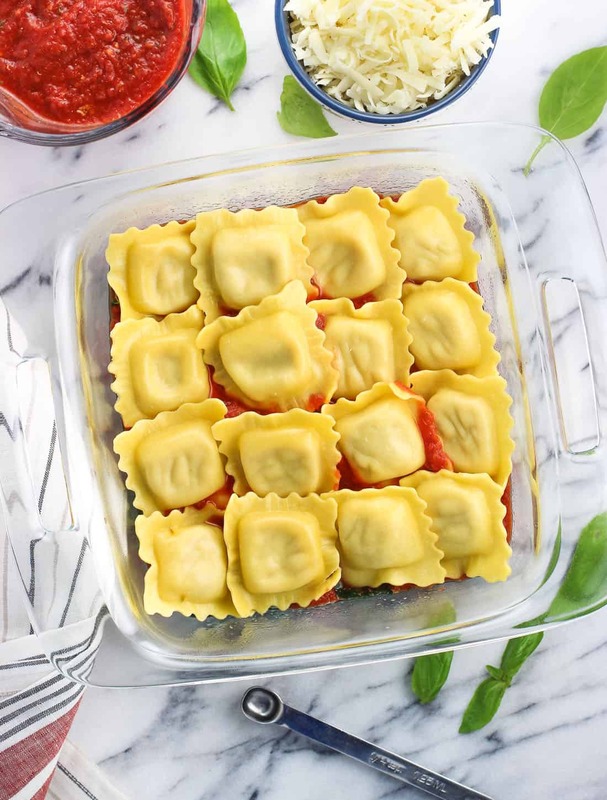 Another reader wrote in saying she made them with frozen ravioli (no thawing), modifying the oven temperature slightly: “I baked on a rack for 20 min in a 425 oven”. She said they puffed up and she enjoyed them, so there are a few ways to do it! Wow! Made these tonight for my son who loves fried raviolis but I don’t want to fry them for him so it’s been a treat at a restaurant. Well no more these were delish and much healthier. I used fresh chicken filled ones and whole wheat bread crumbs!!!! I’m so happy to hear that, Carrie! I bet the chicken ones were great, and that’s such a good idea to use whole wheat bread crumbs for an extra boost of nutrition. Thanks so much for commenting! Yes you CAN do this with frozen ravioli! I just did. Comes out excellent. Just make as usual (working fast so nothing freezes on contact) and I baked on a rack for 20 min in a 425 oven They puffed up and came out great. Thank you for the recipe! Just make as usual? Did you boil the frozen ones first before coating them? Hi Lisa, I used refrigerated ravioli and I didn’t boil them beforehand. I haven’t made these with frozen ravioli, but I’d either stick them in the fridge to thaw a bit before hand, or other readers have had success with using them frozen. Another reader commented “I baked on a rack for 20 min in a 425 oven” and she said they turned out great. I hope that helps! Anyone try using little pierogi so? Hi Sue, I’ve never tried, but I do love pierogi. Please let me know if you give them a shot! Can you use frozen ravioli instead? Hi Diane, I’ve never tried using frozen ravioli, so I’m not sure how they’d turn out. Please let me know if you give them a try though! Do you think you could prepare and freeze these ahead? If so, how long and at what temperature would they need to be cooked? Hi Pam, I’ve never frozen these so I couldn’t say if they’d turn out the same. If trying it I’d probably reduce the oven temperature to cook longer, to allow the filling to heat. I’m not sure what cooking from frozen would do to the exterior though. 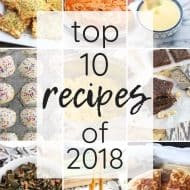 Those look amazing – perfect comfort food! I’m not sure I’ve ever had crispy appetizer style ravioli before, but it’s a fantastic idea! Need to try that soon! Thanks Stacey! I love these as an appetizer! I’ve been thinking about these ever since I saw them on Facebook! I want to try them, especially since they are baked and not fried. Delish!! Thanks Denise! I think refrigerated ravioli have earned themselves a perma-spot on my shopping list haha! 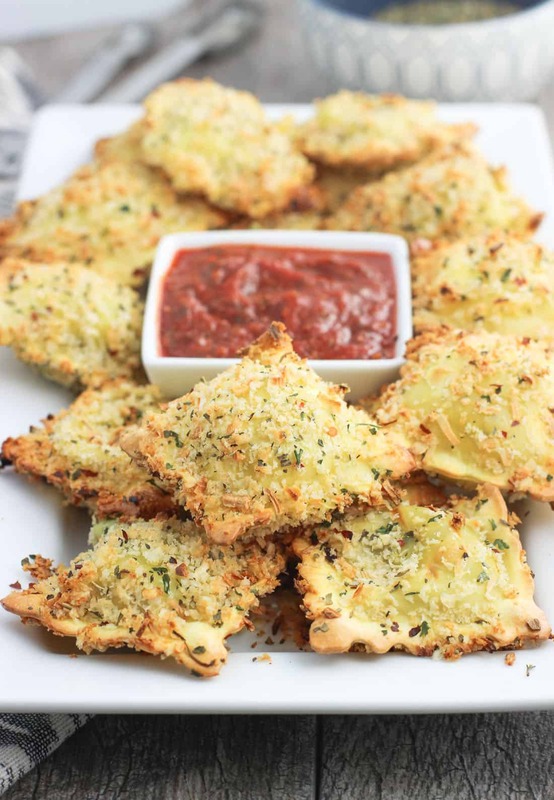 Toasted ravioli are a favorite of mine, and these have me drooling! Can’t wait to try these out! I have grand plans sometime this week to make homemade ravioli or dumplings of some sort…some type of stuffed pastay thing! Haha! Ooooh that sounds amazing Rebecca. I’ve made regular homemade pasta before but never stuffed pasta. Delicious! Omg look at these beauties Alyssa. Swoon worthy for sure!